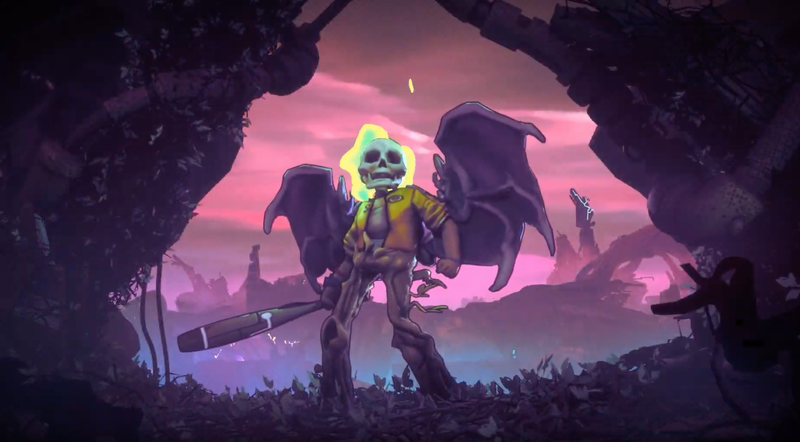 Double Fine Productions has been hard at work on a new game, and it looks "rad." The latest Double Fine game coming to bring us some particularly intriguing mechanics and art direction is Rad. It's a third-person, top-down action game that stars a young boy working to survive in the apocalypse. That's a lot harder than it sounds, mind you. When everything's out there trying to kill you, you do what you can, no matter what – luckily, Rad makes it look kind of fun! A short trailer debuted during today's Nindies Showcase that showed off a hero trudging through a wasteland thoroughly inspired by the '90s. Every step he took found neon green grass springing up, and various mutations plaguing his body. One scene finds him sprouting wings and a snake head. He also finds that his arm is on fire at one point, and lays some eggs that hatch into minions that can help him along the way. If you don't think that sounds totally awesome, you're definitely missing the point. Project lead Lee Petty is taking point on the game, who you may remember from titles like Stacking and Headlander. That's about all we know about Rad right now, but we do know it's touching down on Switch and is coming this summer 2019. Expect to hear more about it over the coming months, potentially head of E3 2019, but it could be that we hear more during the show, too. Keep it locked to Shacknews for additional updates on all the awesome Nindies titles coming down the pipeline throughout the year.